Lingotek Inside Connectors offer out-of-the-box integrations with your most popular web applications: CRM, CMS, eCommerce platforms, knowledge bases, product and support documentation, social business software, marketing automation suites, desktop files, and even software localization. Because we rebuild content right into your system, we eliminate several steps in the usual translation process, streamlining translation. Our open Multilingual REST API supports 23+ file types including the most popular enterprise applications in the industry. We’ve partnered with the most popular enterprise applications so you can work directly in your native environments. Lingotek – Inside Connectors give you the ability to translate content without leaving your site--no working in silos, no switching between applications. Users can translate, localize, update, and publish global content within a single, uninterrupted workflow. As a result, translations are accelerated and the globalization of content becomes faster and more streamlined. 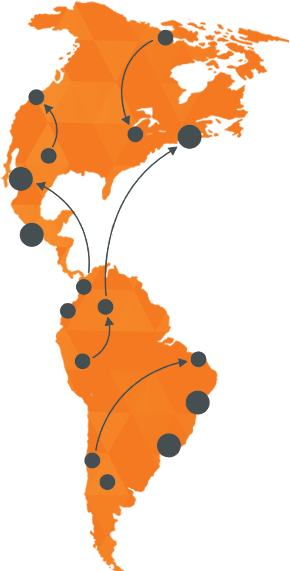 Our Connectors provide access to our industry-leading translation management system (TMS) tools like easy-to-use workflows, Translation Memory, and machine translation. The entire process of authoring, publishing, targeting, optimizing, and personalizing web content is automated with our TMS. With Lingotek’s best-in-class machine translation solutions and real-time community translation and professional translation services, users can easily integrate translation into their existing enterprise applications. Our industry-leading DevZone provides you with all the necessary tools to leverage Lingotek’s multilingual open REST API in order to translate content in any type of web application. Over 100k downloads of the Lingotek Inside - WordPress plugin and 9,000 active installs users who want multilingual translation of their websites. 56,000 Drupal users use Lingotek; our nearest competitor’s users only number in the double digits. The Lingotek - Inside WordPress plugin is consistently ranked as the best multilingual translation technology the industry has to offer. Here is a list of our connectors and we’re adding more all the time! Here is the current list of content management systems we support. Here is the current list of knowledge bases we support. Here is the current list of marketing automation tools we support. Here is the current list of system file repositories we support. Want To Learn More About Lingotek's Connectors Solution? Have a Lingotek representative contact you to help set up your personal Connectors Solution. Check out all of our Inside Resources.